Not sure what to do with that hardbound copy of Atlas Shrugged your crazy uncle gave you? Steve Hoefer has a great idea for what to do with it. Nothing compliments a nightstand like books. They're beautiful, timeless, and illuminating, knowledge and experience collected and bound. But not every book is destined for greatness. Many languish unread and unwanted, others sit on the remaindered shelf waiting futilely for someone to take them home. Publishers themselves destroy around 40% of the books they print. 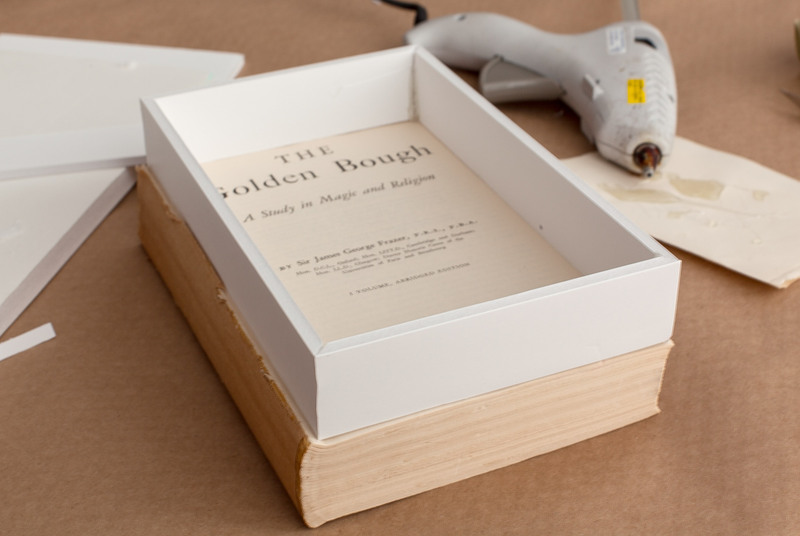 Here's a project to find give new life for those old, ignored, or doomed volumes by turning them into a pleasant source of illumination. 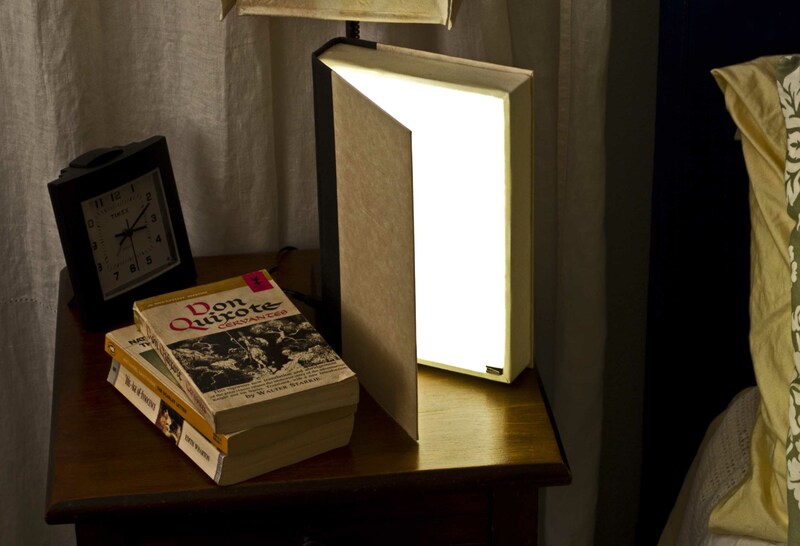 Open the Hardback Reading Light and it will provide a soft glow, perfect for reading your favorite volume. 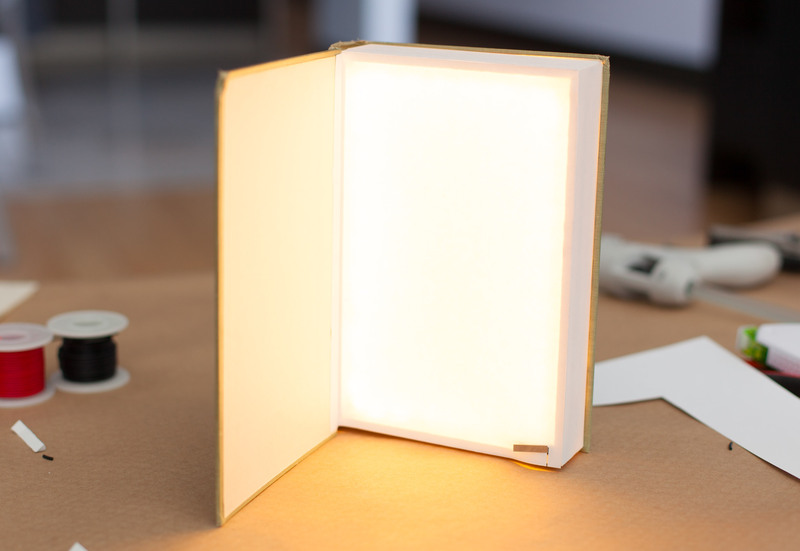 The Hardback Reading Light is a straight forward project that will take a few hours and about $25 in materials. 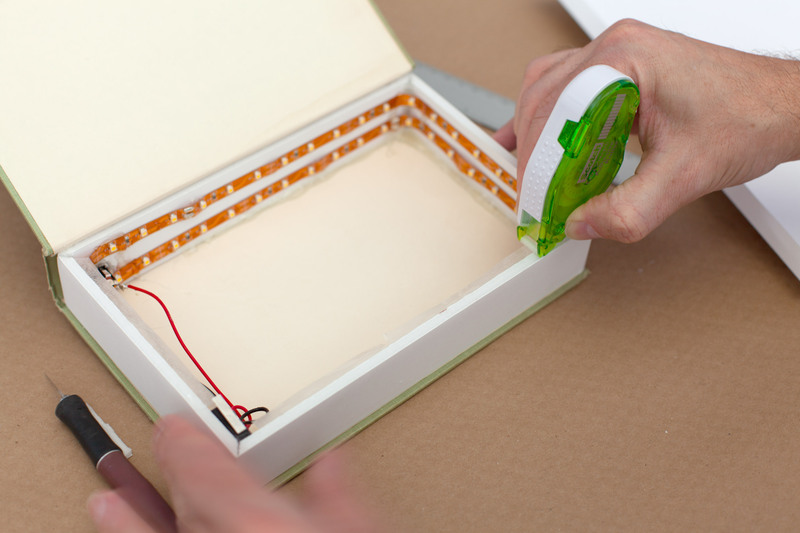 The pages of the book are replaced with a light box lined with LEDs. They're powered through a plug in the spine and a switch in the corner turns it off when the cover is closed. It can be dimmed mechanically by simply closing or opening the cover different amounts. •	Hardback book in good condition. •	White foam board 3/16" or thicker. •	20 or 22 gauge insulated hookup wire. •	Craft knife with fresh, sharp blades. 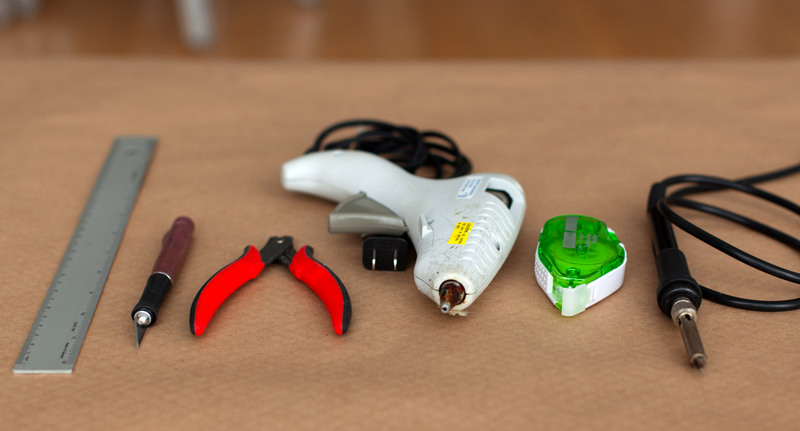 •	Hot glue gun and glue. •	Soldering iron and solder. Start with a sturdy hardbound book, one that looks good without a dust jacket and has a sturdy spine. And a title that won't embarrass you if it's found on your nightstand. Library sales and thrift stores are a great source for books that are looking for a new life. Open the book and use a sharp craft knife to cut the pages out of the spine. If possible keep the first page in the front connected to the cover, it will make things easier later. (It depends on how the book was bound if this is possible or not). It should only take one cut in the front and another in the back. Be extra careful to not cut all the way through the spine. 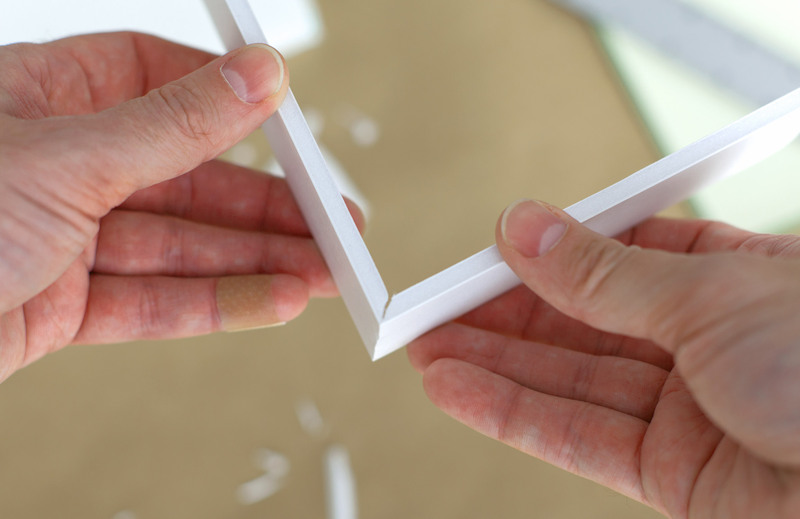 Build a 4-sided foam board frame the same dimensions of the removed pages. If you're careful you can bevel the corners without cutting through the paper backing, making a seamless corner. Check the fit and squareness of the frame against the book covers to make sure it fits nicely. Cut a hole for the power plug in the spine of both the book and the spine of the frame. If the spine has a colophon it can help hide the plug. Otherwise find a place where it won't show too much. To help prevent the cloth of the cover from fraying around the hole, cut an X, fold the corners in and glue them to the inside. 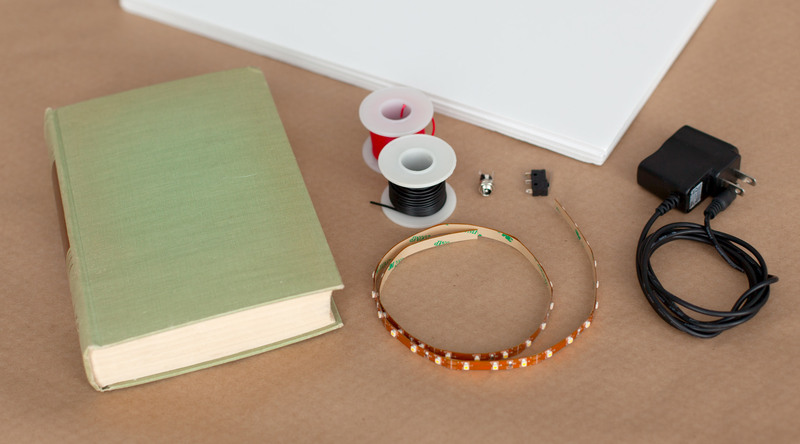 If you want to make your book look a bit more special you can cover the outside of the frame with ribbon, cloth, paint, or decorative paper. 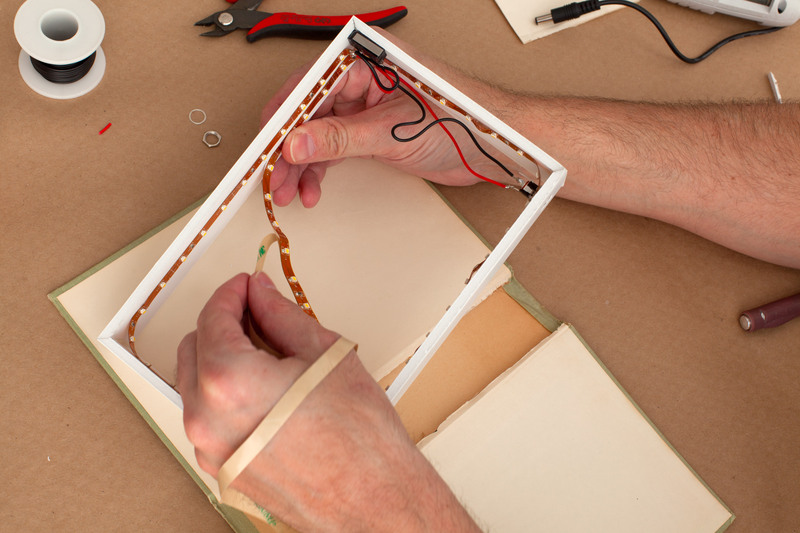 Measure enough LED strip to go around the inside of the frame twice. (You can add more if you want, but more LEDs equals more heat and the whole thing is made of flammable and melty things.) Use scissors to cut the strip at the nearest dotted line. Some LED strips have wires or connectors already connected when you buy them. Feel free to use wires if they're already connected, but cut off any connector. Or cut your section of LEDs from the other end of the strip. •	The edge connector of the power jack and pin 1 (C) of the lever switch. •	Pin 3 (NC) of the lever switch and the negative (-) connector on the LED strip. Test the circuit by plugging the power adapter into the power jack and then the wall. The LEDs should light up when the switch is open and turn off when the switch is pressed. If it it does the opposite check the connections on the switch. If nothing happens at all check every connection, taking special care that the polarity of the LED strip is correct. (+ should connect to the center pin of the power jack, - to the switch, then to the outside pin of the jack.) Also be sure everything is plugged in correctly. When everything is working correctly hot glue the switch into the lower right hand corner of the frame so that the case of the switch is flush with the top of the frame and the metal leaf lever sticks above the frame. The foam board is probably to thick to secure the power plug with the supplied nut, so just remove the nut and washer and hot glue it in place. 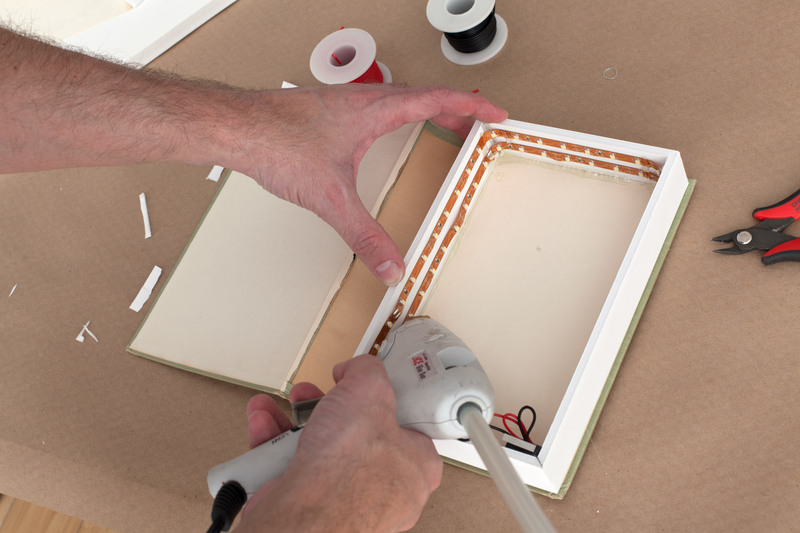 Finally attach the LED strip to the inside of the frame, removing the adhesive backing as you go. 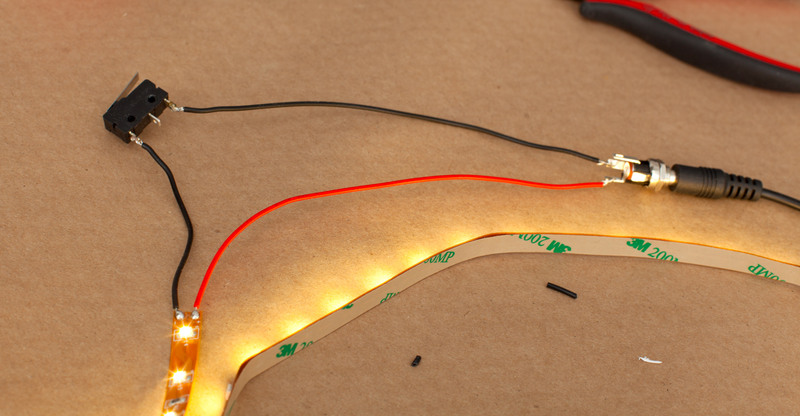 LED strips don't like to be abused, so avoid crimping it or bending it too sharply, and be especially careful with the end that has the wires soldered to it. If the adhesive feels a bit weak reinforce it with hot glue, especially near the corners. Attach the finished frame into book cover, hot gluing it to the inside of the back cover first, then gluing the spine in place. Start with a sheet of plain paper larger than your book, and crease a fold 3/8" (1cm) along the long edge of the paper. 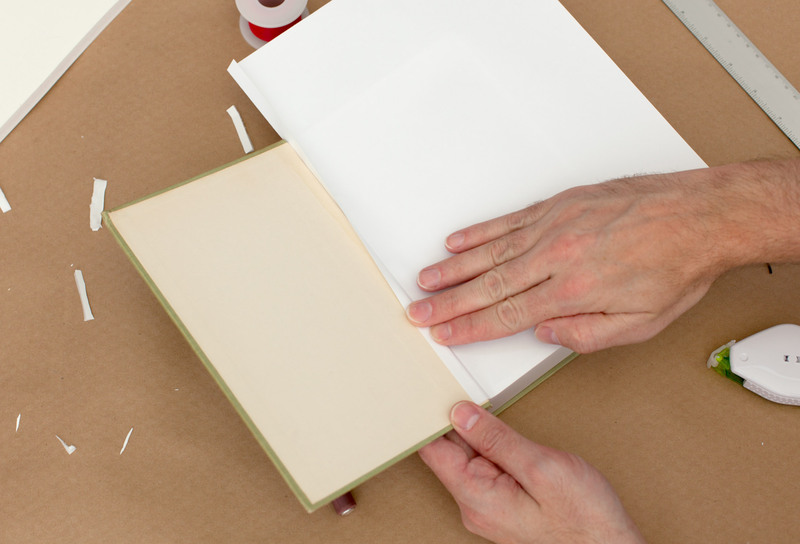 Lay the page down on the frame with the folded edge pressed as far as possible into the spine. Cut a slit for the base of the lever switch to pass through. Place double sided tape top edge of the frame. Try to keep it from passing the outside edge or it will tend to collect dirt. Attach the paper to the top of the frame, putting the creased edge as far in to the spine as possible and working from the spine to the edge of the book. With the cover folded open, apply double sided tape to the back of the fold, then press it back so it sticks to the cover. This will hide the ragged cut of the spine. When everything is securely fastened carefully cut the remaining paper from the outside of the frame. Lay the page down on the frame and cut a slit for the base of the lever switch to pass through. Place double sided tape top edge of the frame. Try to keep it from passing the outside edge or ti will tend to collect dirt. 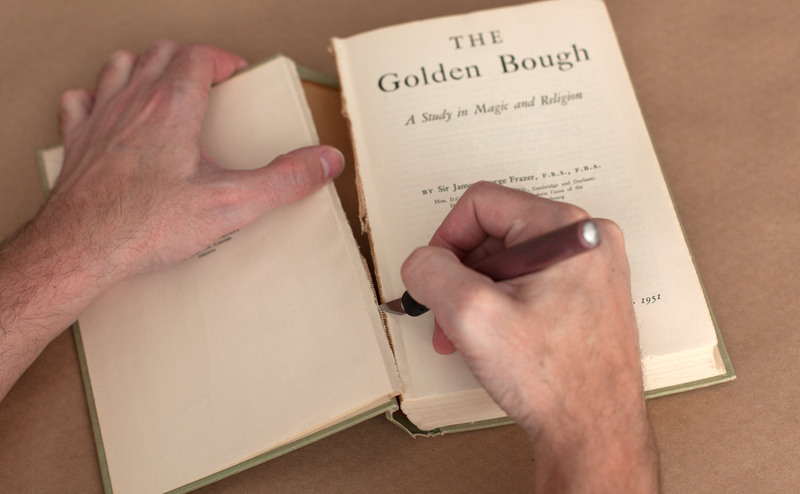 Carefully press the front page into place over the frame, working from the spine to the outside edge. You're done! Put it on your nightstand and plug it in. Open it up and set it on edge to light up your reading, lay it down and close it to turn it off. •	Build the frame out of more durable materials, like plywood. •	Replace the paper light diffuser with an acrylic light panel for better diffusion and more durability. •	Improve the look of the "paper" with paint, cloth, paper, or gold gilding. •	Use a reed switch and a magnet on the cover instead of the mechanical switch.